Gas prices are getting obscene again, but we will pay them. The oil companies know that we have no choice; we will pay whatever they charge because, on a mass-scale, we have no other viable options readily available to us. 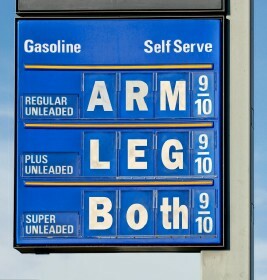 Granted, I do not fully understand the way gasoline is priced, but let’s face it, gas prices go up – period. I’m not talking about inflation, or the fact that most goods and services will naturally increase in price over extended time periods. This isn’t like that. Gas prices are far more artificially-influenced. I fully believe that the vast majority of gas stations (and their parent oil companies) are little more than opportunistic piranhas who systematically take advantage of us. For every two-steps forward, it’s only one-step back. Every time there is unrest in an oil-producing nation, such as what’s occurring in Libya today, we experience an overnight pricing jolt at the pumps. I get it… I know that the price we pay at the pump now is based off some oil-company-favoring algorithm dependent on their anticipated future oil cost per barrel. Gas prices decline ever so slowly on good news. I wonder why oil companies, that continue to make record-breaking profits, are so seemingly pessimistic. I know this sounds like I’m making oil companies out to be the bad guys, but honestly, it’s not their fault. It would be stupid-business to not take advantage of every opportunity to make money and profit. Are they shady in their practices? Yeah, I think they are to a degree, but it is what it is. We are the real problem when it comes to gas prices. We continue to buy gasoline. Reduce your speed; stay below 55 mph. Remove excess weight from you car or truck. Make fewer trips or combine trips. On hot days, do not use your air conditioner unless you are traveling in excess of 55 mph. With the “9/10ths” in each price, you actually have to pay 1.9 arms, 1.9 legs or 1.9 of both.